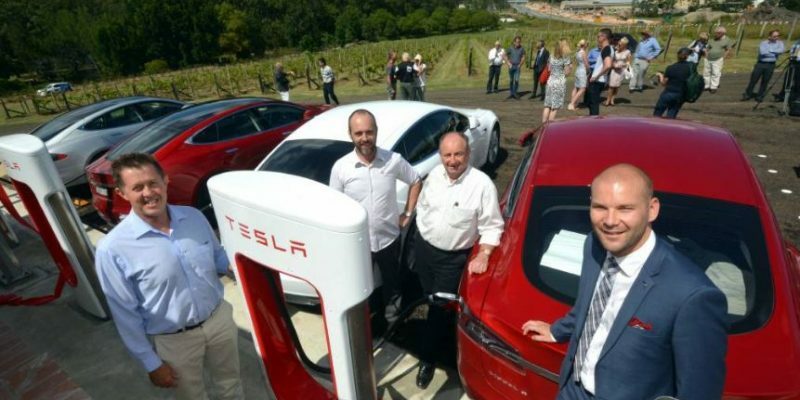 The future of motoring has arrived at Cassegrain’s estate in Port Macquarie, with the installation of the first Tesla Supercharger Station north of Sydney. The official ribbon-cutting ceremony on Tuesday 22nd March 2016 was attended by the Hon. Luke Hartsuyker MP along with key Tesla Motors personnel and local media. The supercharger system is capable of adding up to 270km of range to the Model S in just 30 minutes. With Goulburn, Gundagai and Wodonga already online, Cassegrains represents the start of the northern link to Brisbane. John Cassegrain said a family connection helped get the deal over the line but being so close to the highway proved the winner. The Tesla Model S electric vehicle drivers can travel for about three hours before they require recharging. Sydney’s Bruce Gold joined the Tesla ‘family’ in September and says he’s now an ambassador for the company and the car. “This vehicle is light years ahead … the data that is available at your fingertips is unreal and the car provides a quieter, smoother ride,” he said. “You can check your tyre pressure, plan your trip, automatic lighting system that engages high beam when required but also switches off when a car is approaching, features auto parking and auto drive … and the wow factor when you put your foot down is also there.